Pitting is a set of optional rules that add a different strategic layer: how often to pit, when to pit, and which tire compounds to use. In addition to being able to pit for additional wear, cars also get a choice of different tire compounds. 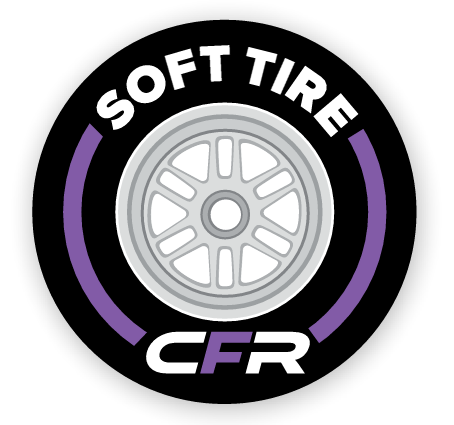 Soft tires let drivers spend a wear instead of testing acceleration, deceleration, or start speed, or instead of rolling a chance. So, cars on soft tires can spend 3 wear in a single corner but not 3 wear and a chance. Hard tires gain wear as the race progresses. Every time that a car on hard tires crosses the start/finish line without pitting, they gain wear equal to their car’s hard tire bonus. Note that hard tires do not grant bonus wear when cars cross the start line at the start of the race or when they cross the finish line at the end of a race. When building your car, use the pitting wear rating instead of the standard wear rating. Give each driver a double-sided tire marker. 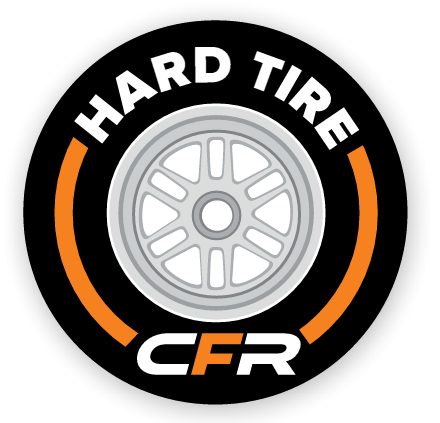 These are used to indicate which tire the car is currently using: Hard or Soft. Give each driver a pit marker, these are used to note how long a car has been in the pits. Before making their pole bid, every driver places their tire token on one side indicating their desired starting tire. The token can be placed under their wear card. After the bid, place the tire marker that you selected next to your remaining wear on your wear card. Before making their pole bid, every driver places their tire token on ine side indicating their desired starting tire. The token can be placed under their wear card. After the bid, place the tire marker that you selected next to your remaining wear on your wear card. Cars may pit at the end of any lap to reset their wear to their starting total but each stop in the pits takes two turns to complete. The pit lane is a white lane of spaces that extends from the last space of the last corner of the track some length down the track’s front straight. The pit lane can only be used by a car that is pitting. When a car ends its move in any part of a row that contains a pit space, the car may enter the pit. These rows are marked by small orange triangles ( ) on the track pointing toward the pit lane. The car does not need to be in a space adjacent to the pit spaces, just anywhere in that same row. 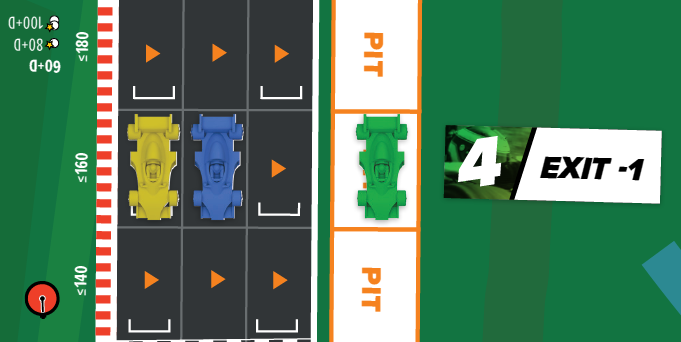 For example, the green car below can enter the pit from where it is. When a car enters the pits it is immediately moved to the pit lane after it has concluded its move and before any other cars move this turn. Note that the car does not change its speed and that there is no penalty for entering the pits on the same turn as a spin. We see that the green car has decided to pit this turn and has been moved next to the yellow car (see below) that was in the pits at the start of this turn. Any number of cars can exist in the same pit space at a time. When a new car enters a pit space that already has a car in it, the new car is placed further away from the track to preserve the order in which the cars arrived in the pits. After all cars that started this turn on the track have moved, cars in the pit move. Cars that were in the pit at the beginning of this turn will have a pit turn marker near them. Cars that just entered the pits this turn will not. Cars in the pits act in the order they arrived in the pits. First we deal with any cars whose marker is on the yellow, EXIT -1 side. These cars are exiting the pits. 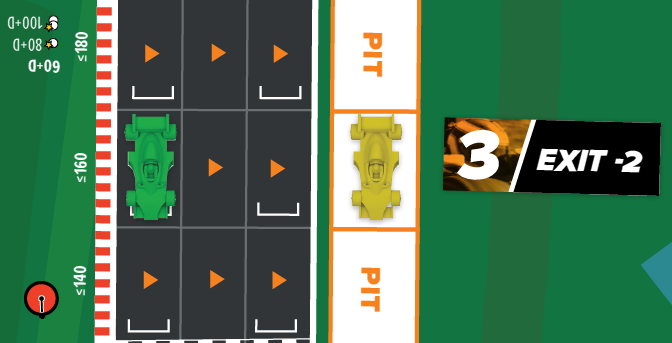 Remove the pit turn marker from track-side and move the car onto the track to an empty space closest to the red and white striped side of the track. Above, the blue car is has just exited the pits. The car started this turn in the pits with the EXIT -1 marker near it. Earlier this turn the yellow car moved to the same row but did not enter the pits, the closest empty space to the red and white striped side of the track is the middle space in this lane. Since this happens after all cars on track have moved, the blue car does not move this turn. Next turn, however, will be a regular turn for this car. Remember that the car’s current speed is the same as when it entered the pit. If the car spun the turn it entered the pit, then the same rules apply to it as any other car the turn after a spin. 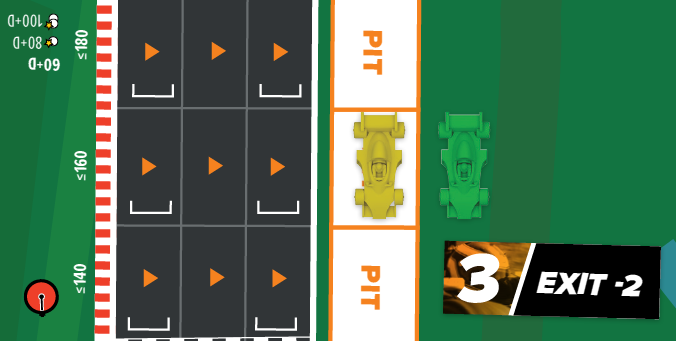 In the unlikely event that all of the spaces in the row are full, the car exiting the pits is placed next to the car in the space furthest from the red and white striped side of the track as shown below. For this turn only, both the red and green cars are considered to occupy that same space. After all cars that should exit the pit have done so, any car in the pit with an EXIT -2 pit marker gets new tires. Cars getting new tires select what type of tire they will be exiting the pit with, gain wear equal to their starting wear total (pre-pole bid), and then reset their tire marker to reflect the car’s current tire. After gaining new wear, the pit turn marker next to that car should be flipped over to the EXIT -1 side. This car will move back onto the track next turn. Finally, any car that just entered the pits this turn will not have a pit turn marker next to them. Place the EXIT -2 side up next to each of them.